This mid-thirteenth century German psalter has acquired the nickname "The Laughing Carp Psalter" due to its penwork illustrations. 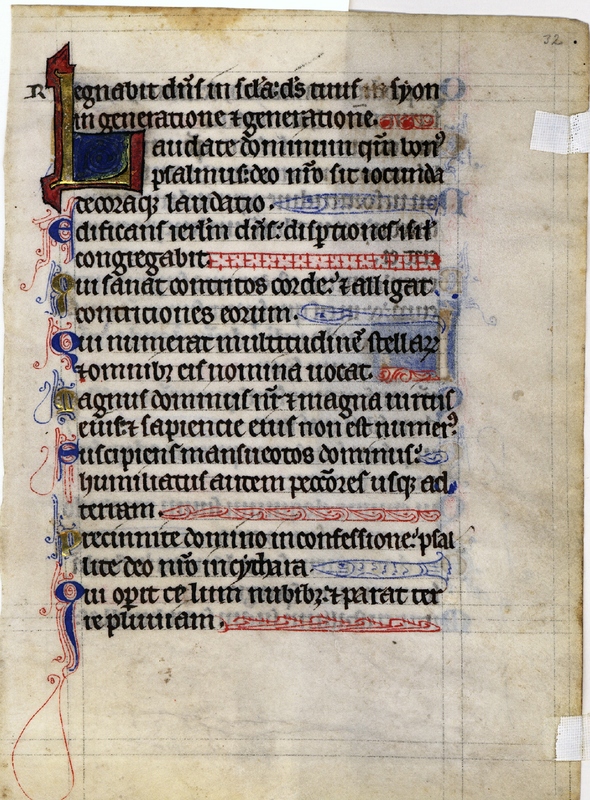 The decorative style involves using fish (one of the leading medieval symbols for Christ) to complete lines of text that do not reach to the right margin of the page; this maintains the aesthetic of a full page within the borders of the leaf. The leaf itself measures 19.5 x 14cm, with slightly yellowed and stained vellum, and is lined in ink. The ink used for the bulk of the text is very dark, but fades into brown in places. Blue, red, coral, orange, and white are used in the decoration, and scribal corrections are included above each line where necessary. 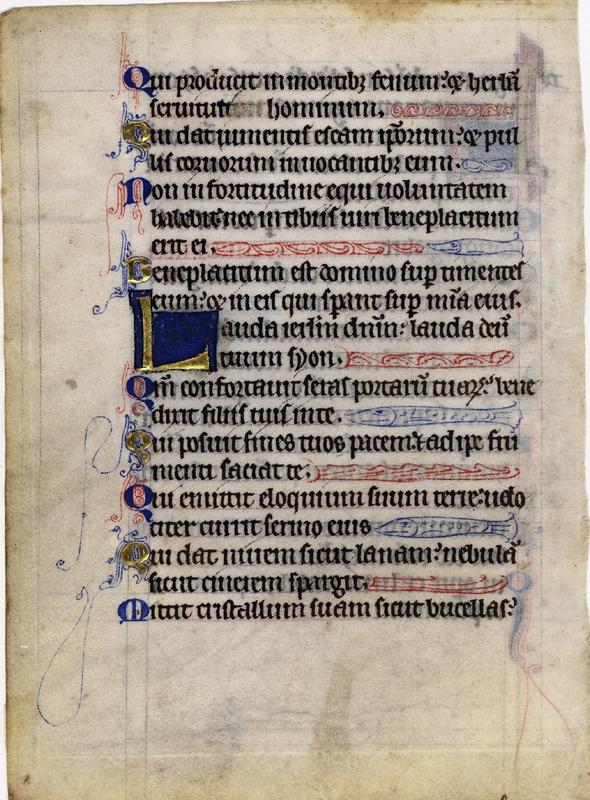 See Denison University Leaf 10 for more information about this manuscript. Text: Psalms 145:10-146:8 (recto) and 146:8-147:6 (verso). Regnábit Dóminus in saecula; Deus tuus, Sion, in generatiónem et generatiónem. Laudáte Dóminum, quóniam bonus est psalmus; Deo nostro sit jucúnda, decoráque laudátio. Qui númerat multitúdinem stellárum, et ómnibus eis nómina vocat. Magnus Dóminus noster, et magna virtus ejus, et sapiéntiæ ejus non est númerus. Suscípiens mansuétos Dóminus; humílians autem peccatóres usque ad terram. Præcínite Dómino in confessióne; psállite Deo nostro in cythara. 10 The Lord shall reign for ever: thy God, O Sion, unto generation and generation. Qui dat juméntis escam ipsórum, et pullis corvórum invocántibus eum. Non in fortitúdine equi voluntátem habébit, nec in tíbiis viri beneplácitum erit ei. Beneplácitum est Dómino super timéntes eum, et in eis qui sperant super misericórdia ejus. Lauda, Jerúsalem, Dóminum; lauda Deum tuum, Syon. Quóniam confortávit seras portárum tuárum; benedíxit fíliis tuis in te. Qui pósuit fines tuos pacem, et ádipe fruménti sátiat te. Qui emíttit elóquium suum terræ: velóciter currit sermo ejus. Qui dat nivem sicut lanam; nébulam sicut cínerem spargit. ...and prepareth rain for the earth. Who maketh grass to grow on the mountains, and herbs for the service of men. 9 Who giveth to beasts their food: and to the young ravens that call upon him. 10 He shall not delight in the strength of the horse: nor take pleasure in the legs of a man. 11 The Lord taketh pleasure in them that fear him: and in them that hope in his mercy.